Manual In/Out staff will enter their Time In and Time Out for each day. If a staff person worked for 2 different departments or locations, or if they took a lunch during their day shift, they should add a new line for the day by clicking the + button. The Clock-In/Out button can also be used by staff with the Manual In/Out Time Entry method. 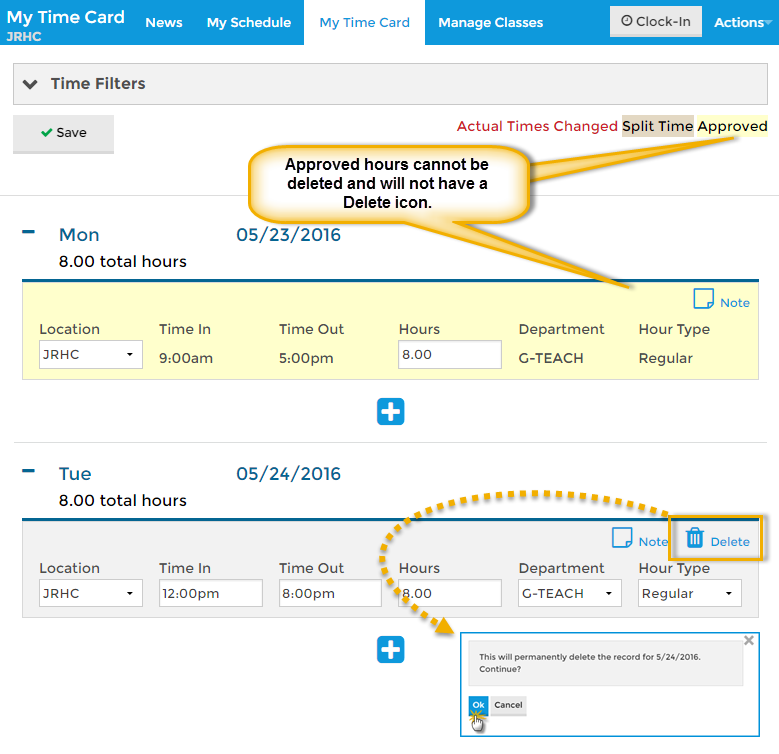 Staff with the Manual In/Out time entry method have the ability to record time entries after the date worked. This is true even if the pay period has closed. Example: The pay period runs from 5/1-5/14. Staff person Jen Beta forgets to enter her 5/13 time and the pay period has been closed. On 5/20 Jen remembers she forgot to enter this time. She can then add the time entry with the accurate date of 5/13. Any time entry which is outside of the current pay period can be found during the Close Pay Period process.